Okay, fam. It’s getting hot, real quick, and we need to chill. Time to take a dip into something refreshing. Something cool. Something delicious. These new-wave shave ice treats are just what we need! Loaded with mochi, popping boba, fruit and condensed milk. 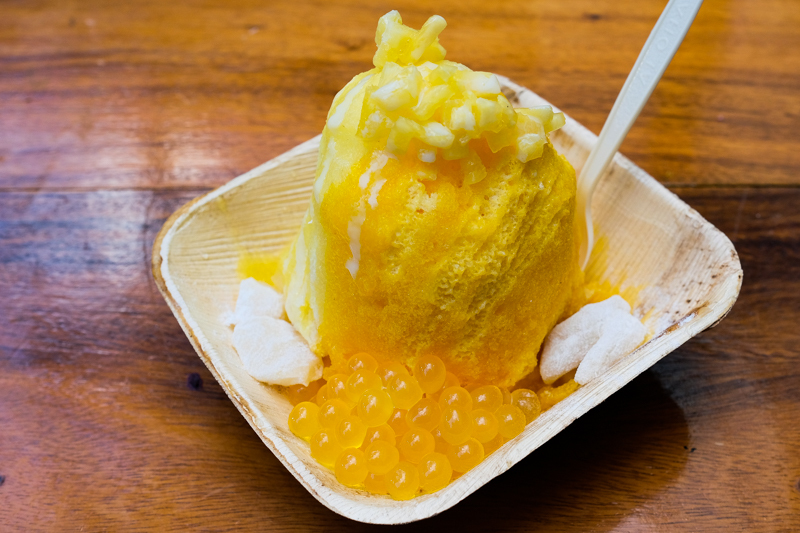 A mountain of pineapple and lilikoi-flavored shaved ice cocoons a core of vanilla soft serve in Island Vintage’s Tropical Island shave ice. There are enough chewy mochi bits, popping boba pearls and chunks of fruit to last you to the end, but the ice is so fine you’ll need to eat quickly unless you like drinking your dessert. At $7.95, this shave ice offers the most bang for your buck. Kona orange shave ice with dulce de leche sauce is a dreamsicle in disguise. Traffic-clogged streets may signal a shift for once-sleepy Kailua town, but they don’t stop me from heading over the Pali for a cup of shave ice at The Local Hawaii. Located on Hekili Street in the Aloha Beach Club, The Local has a menu of locally sourced seasonal syrups ranging from fresh, fruity mango to dreamy, creamy Tahitian vanilla. I’m a fan of the Kona orange with a generous coating of dulce de leche sauce ($6.25) – it’s a velvety Dreamsicle in disguise. The ice texture is a medium weight and melts on your tongue. Shave ice is a new item on Maiko’s menu. You already know how crazy I am about matcha. After much research (about 35 visits to date), I’ve come to the conclusion that I prefer the soft serve at Matcha Stand Maiko over the other shops in town – it’s grassy, yet sweet enough to gobble in a few minutes. Maiko’s rather sizeable shave ice cones, three with soft serve ($7.50-$7.80) and one without ($5.20), have caught my attention as of late. 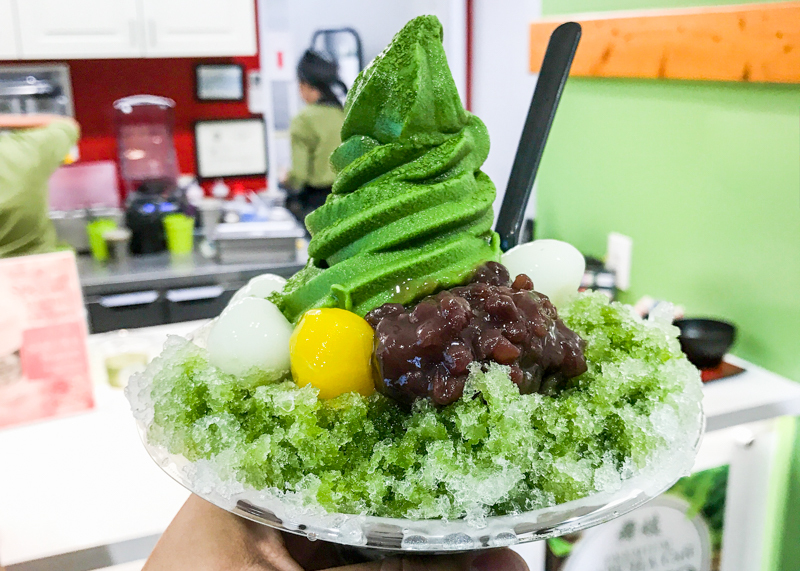 Clearly, the one to get is the one with matcha soft serve, which is further dressed with azuki beans, shiratama mochi balls and a water chestnut. The ice is on the thicker side and has a nice crunch that complements the other textures. 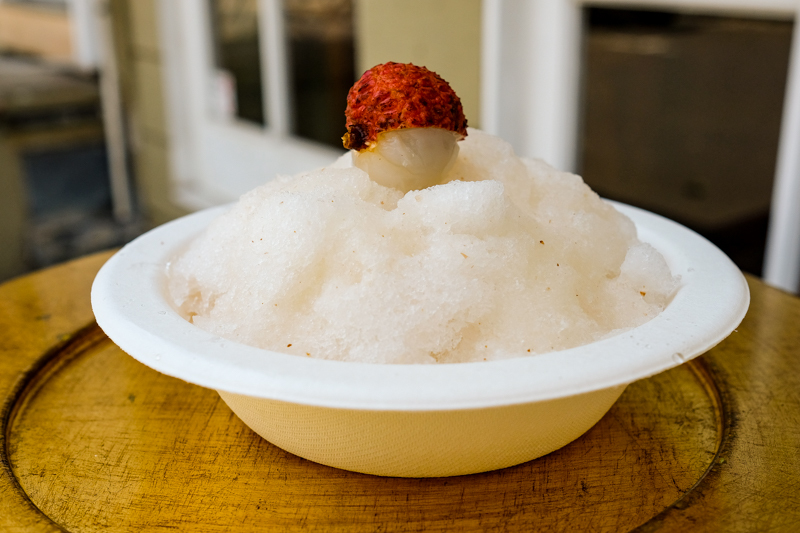 Lychee from Hilo is flown in to make this crisp and refreshing summer-only shave ice. Lychee flown in from Hilo are hnad-shelled, pitted and reduced to an extract at Lemona Hawaii’s Waikiki outpost. In fact, Mamiko Ando and her team repeat this process for all of their “syrups,” but the lychee ($7.50) has to be the best one they make. 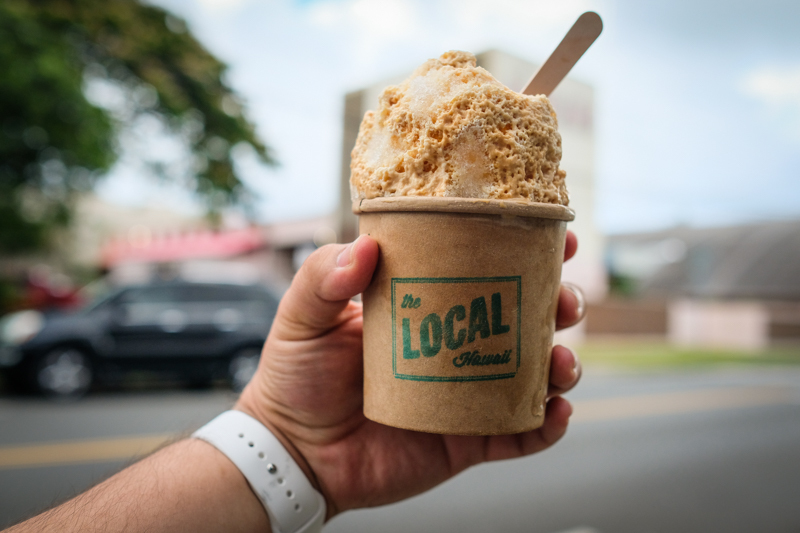 Because the fruit is seasonal, this shave ice flavor is only available for a short period during the summer and what a refreshing treat it is. The ice is fine and soaks up the juicy syrup so well. It’s as if you’re biting into a lychee fresh from the freezer. Michelle Karr-Ueoka’s favorite childhood treat, shave ice. Local pastry chef and MW Restaurant co-owner Michelle Karr-Ueoka teamed up with celebrity chef Michael Mina to open Aloha Ice in The Street food hall, a concept she had been dreaming about. You’ll find no syrups here. In true Karr-Ueoka fashion, she compresses fresh fruit into cylindrical blocks for freezing, then shaves them to a fine powder over scoops of sorbet or gelato layered with fruit, mochi ice cream and more. 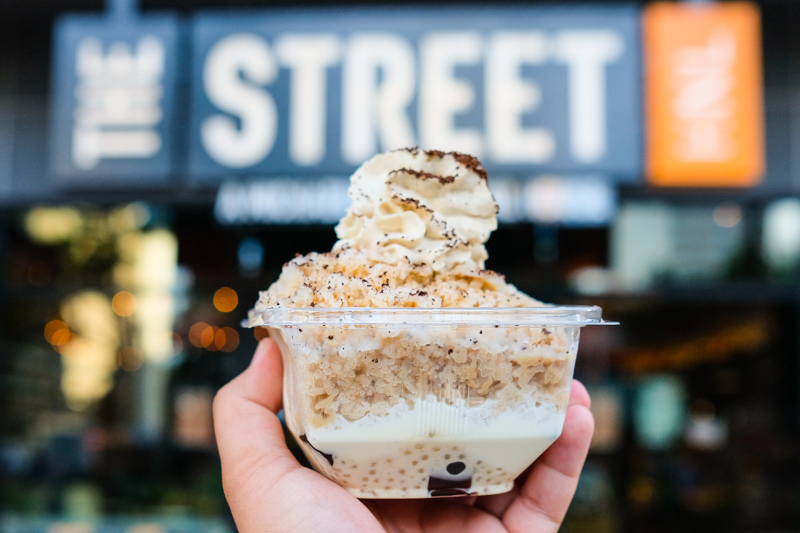 The Kau Coffee & Cream ($9.95) takes inspiration from her Affo-misu dessert at MW: Vanilla panna cotta, coffee tapioca, coffee kanten, chocolate rice pearls and mochi ice cream chill out under a blanket of shaved Vietnamese coffee, coffee gelato and aerated coffee. It’s what I want in my mouth right now.